Refresh your feet and eliminate foot odour with this convenient, refreshing Tea Tree Foot Spray. Neutralises odours. Cooling, refreshing spray. Contains 100% pure Australian Tea Tree Oil. Aqua / Water, Alcohol, Zinc Phenolsulfonate, Polysorbate 60, Melaleuca Alternifolia (Tea Tree) Leaf Oil, Triethyl Citrate, Parfum/ Fragrance , Camphor, Menthol, Benzyl Benzoate, Benzyl Salicylate, Coumarin, Eugenol, Limonene, Linalool. Use daily on dry feet especially between the toes. Spray into shoes and socks for continued protection.For external use only. It is recommended you skin patch test prior to use. Below are reviews of Thursday Plantation Tea Tree Foot Spray - 50ml by bodykind customers. If you have tried this product we'd love to hear what you think so please leave a review. 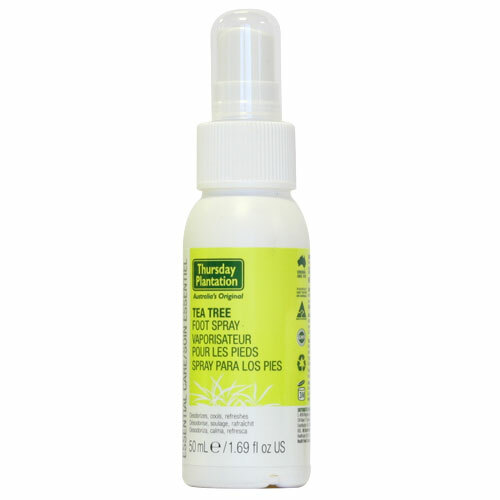 Refresh your feet and eliminate foot odour with this convenient, refreshing Tea Tree Foot Spray.